Summary: Researchers find changes in masticatory stimuli can modulate neurogenesis and hippocampal function. Published in the Journal of Dental Research, findings reveal reduced mastication impaired learning and memory function in mice. According to researchers, the frequency of mastication has dramatically decreased along with changes in dietary habits. Masticatory stimulation has influence on the development of the central nervous system as well as the growth of maxillofacial tissue in children. Deterioration of masticatory function due to aging and the consequent reduction of brain function has become major problems. Although the relationship between mastication and brain function is potentially important, the mechanism underlying is not fully understood. In order to prevent brain function disorders, including those relating to memory and learning, it is an urgent task to elucidate the linkage between masticatory function and brain function. Researchers found that growth of the maxillofacial bone and muscle were suppressed in mice with reduced masticatory stimuli by feeding with powder food. In addition, behavioral experiments revealed that reduced mastication impaired memory and learning functions. In the hippocampus, a major component responsible for memory, neural activity, synapse formation and expression of brain-derived neurotrophic factor (BDNF) were reduced in these mice . Thus, the authors demonstrated that the changes in masticatory stimuli can modulate neurogenesis and neuronal activity in the hippocampus, functionally contributing to cognitive function. This research suggests that maintaining or strengthening of masticatory function would be effective in preventing dementia and memory/learning dysfunction. It is also suggested that further elucidation of the mechanism linking mastication and brain function can lead to novel treatments and preventive measures for memory/learning dysfunction in the future. Funding: Japan Agency for Medical Research and Development, Japan Science and Technology Agency, Ministry of Education, Culture, Sports, Science and Technology funded this study. Image Source: NeuroscienceNews.com image is credited to Department of Cell Signaling,Department of Orthodontic Science (TMDU). Tokyo Medical and Dental University “Chew On This: Reduced Mastication Impairs Memory and Learning Function.” NeuroscienceNews. NeuroscienceNews, 10 July 2017. Mastication is an indispensable oral function related to physical, mental, and social health throughout life. The elderly tend to have a masticatory dysfunction due to tooth loss and fragility in the masticatory muscles with aging, potentially resulting in impaired cognitive function. Masticatory stimulation has influence on the development of the central nervous system (CNS) as well as the growth of maxillofacial tissue in children. 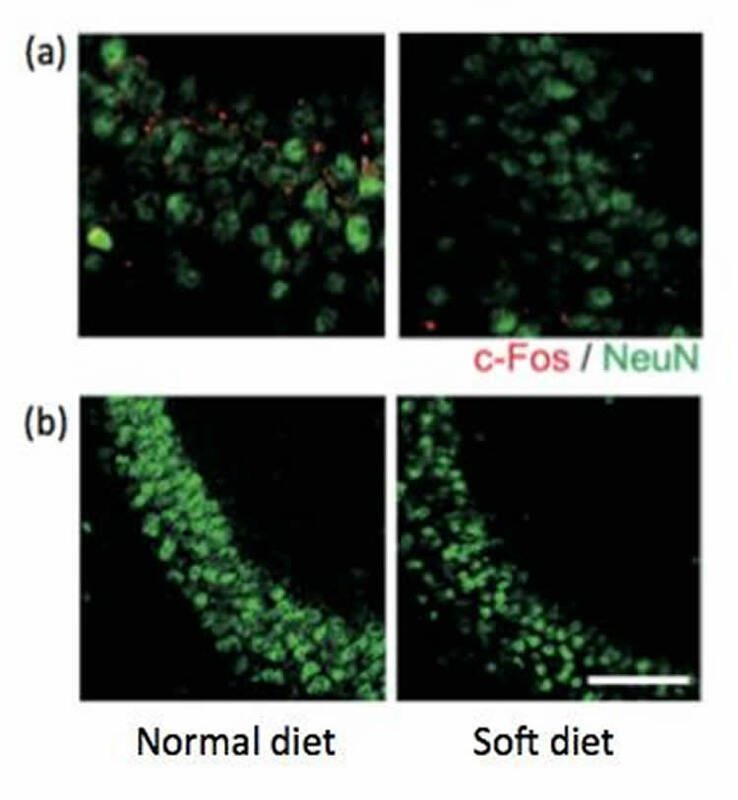 Although the relationship between mastication and cognitive function is potentially important in the growth period, the cellular and molecular mechanisms have not been sufficiently elucidated. Here, we show that the reduced mastication resulted in impaired spatial memory and learning function owing to the morphological change and decreased activity in the hippocampus. We used an in vivo model for reduced masticatory stimuli, in which juvenile mice were fed with powder diet and found that masticatory stimulation during the growth period positively regulated long-term spatial memory to promote cognitive function. The functional linkage between mastication and brain was validated by the decrease in neurons, neurogenesis, neuronal activity, and brain-derived neurotrophic factor (BDNF) expression in the hippocampus. These findings taken together provide in vivo evidence for a functional linkage between mastication and cognitive function in the growth period, suggesting a need for novel therapeutic strategies in masticatory function–related cognitive dysfunction.